Cakes and pies are divine, but once in a while, perfectly cooked fruit is the best dessert choice. 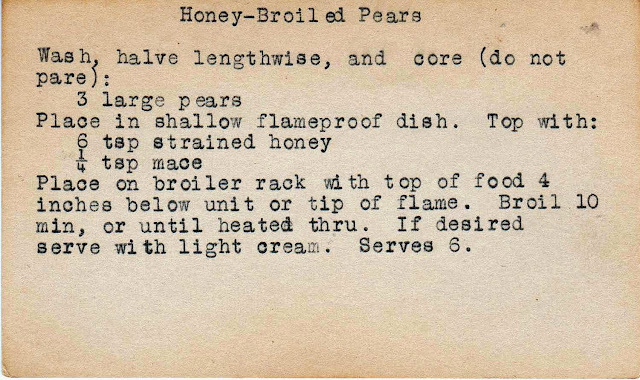 Poached pears are among my favorites, but one needs some variety, so I was delighted to come across this vintage recipe for honey-broiled pears. Just 15 minutes after I began, I was enjoying a lovely autumn dessert. Start by choosing ripe fruit (not the unripe ones I bought that morning at the farmer's market.) 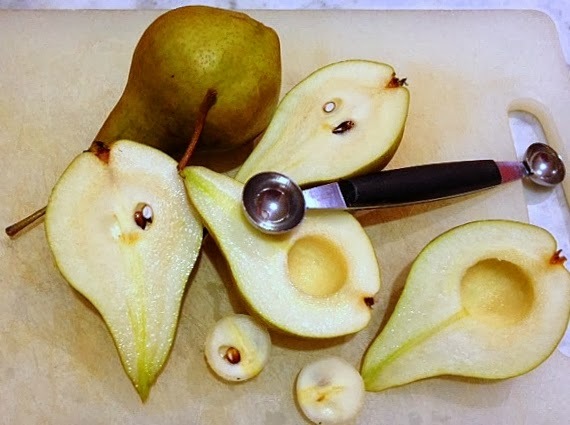 Half the pears and then remove the core. A melon baller (is that what this tool is called?) worked perfectly. 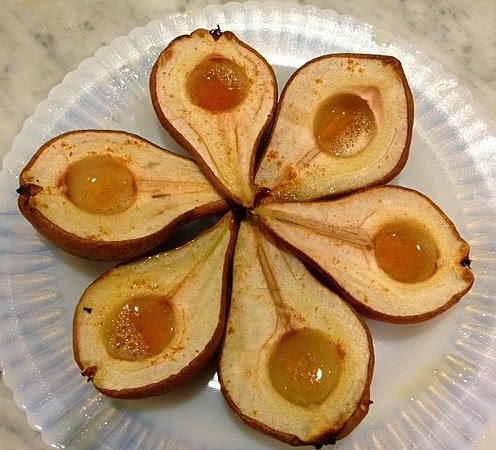 Place the pear halves in a dish and cover each with one teaspoon of honey and a bit of mace. 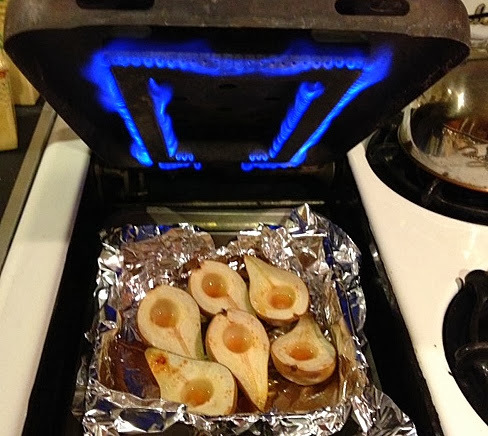 Broil for ten minutes (or longer, as I did, to compensate for the unripe fruit). I'm lucky enough to have a stove top broiler, which makes broiling less daunting. I followed the recipe exactly, but did not strain the honey (mostly because I didn't know what that meant). Next time, I'll use ripe fruit and replace the mace (which I don't like, I discovered) with cinnamon. Note that this serves six: one pear half per person. No supersizing of even healthy desserts in the 1940s! YUM! I love these, and I do like them with cream poured over them. I'm with you, cooked pears are wonderful. sounds yummy. but how about a little frozen yogurt on top. I wonder if "straining" the honey was to get extra bits of the honeycomb out which wouldn't be necessary for most honey today but might of been more common then.